... It starts with a "W," & the rest sounds like "anchor." 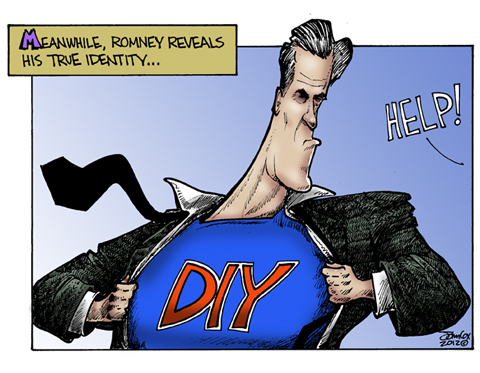 Ha, I really like this comic and Captain DIY, but did I miss the news story that explains how this applies to Romney? Or is the implication that if the government doesn't do it for you, then you are on your own? -- that compassion means voting for the government to seize from some people to give to others, only to achieve inefficient and corrupt entitlements? I've noticed these pernicious lies have made a resurgence lately, so maybe this is the reference. Just look at Romney's voluntary charitable contributions to judge his cold-heartedness or personal willingness to help others. Look at the charitable contributions of republicans vs. democrats in general to see who is truly compassionate and who would simply appease their consciences by voting that someone else be charitable, just not themselves. What kind of a person says, "I will only be charitable if everyone is forced to be charitable in the exact same, inefficient way"? A modern democrat, that's who. It's sad when political labels are exactly opposite the truth. is at odds with his other statements among other lesser monied crowds. His messages are all over the place. This toon is an opinion about an inner identity that seems accurate: His administration will avoid wet-nursing a certain needy type. I know that people are reading a lot into his 47% statistic, but I'm actually not that familiar with his recent mixed messages, so I'm interested in learning what specifically you are referring to. I have noticed that Ryan's handling of SS, for example, is very subtle. e.g. praising its importance even while entirely restructuring it in order to "preserve it". It's a fascinating embrace and modify tactic. "His administration will avoid wet-nursing a certain needy type." That's certainly true, and when you put it that way, it sounds reasonable. I'd like a DIY shirt, but it has to have grease stains, a couple of holes, at least 1 blood stain and a few misplaced glob of paint. I don't find Obama to be confusing at all - he promises stuff, doesn't deliver and blames everyone and everything except himself. Meanwhile, it's all about the "O". I think Romney needs to get his message refined, pinpointed and delivered with tight focus. And he needs to avoid the distractions his opponent and his media cronies throw at him. Get America working for everybody. I'm PO'ed by the selective ethics of the "media." Mother Jones leaks these tapes (which are illegal by Florida law), but the LA Times won't release a video or a transcript of the Khalidi tape. Also, I didn't like T's comment when I first read it, but I'd rather see a preemptive comment instead of what might have followed. This page contains a single entry from the blog posted on September 25, 2012 12:23 AM.